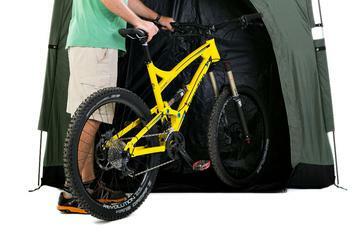 YardStash II Outdoor Storage: Keeps Your Bikes and Outdoor Gear Dry and Accessible. Guaranteed. The YardStash II is guaranteed to keep your bicycles, gardening tools, pool equipment, kids’ toys and other outdoor gear dry and accessible. No shortcuts – just the best materials. Heavy duty UV protected polyester, strong zippers, sealed seams, reinforced integrated floor, thick interior weatherproof coating and a patented design to shrug off the elements. The compact, space-saving footprint respects your outdoor living spaces and the quick set-up (less than 15 minutes for one person) gives a nod to ease-of-use. Compare with Storage Sheds Compact size (74" wide and 30" deep) and integrated rip proof floor to easily stash two adult bikes, long handled garden tools, pool floats or other outdoor gear. Better Than a Bike Cove Better than bike covers and outdoor furniture covers - complete coverage and protection. Space Saving Outdoor Storage Patented watershedding design, sealed seams and heavy duty polyester material to shrug off rain and snow. Corner and back grommets to secure your YardStash II to fence and/or ground. In-&-Out Floor Flap for Easy Outdoor Storage NEW FOR AUGUST 2013! In-&-Out Floor Flap folds down to make it easy to roll in and roll out bikes, lawn mowers, wheelbarrows, grills and other gear. Heavy Duty Storage Tent Easy access and thick interior weatherproof coating to keep your gear bone dry. Outdoor Storage for Two Bikes Fits two adult bikes with room to spare. Bike Shed Alternative In-&-Out Floor Flap folds up for complete protection. Secure Outdoor Storage Back wall velcro opening to secure bikes and equipment to fence or post. Lawnmower Storage Solution Not just for bikes - Stash lawn mowers, wheelbarrows, coolers, generators and other outdoor gear. Better Than A Lawn mower cover Easily fits lawn mowers and long handled tools. Tough Outdoor Storage Heavy duty, storm flapped, rubber tabbed zipper for easy access and durability. Easy Set-Up Integrated EzClips for fast & easy 15 minute assembly. Interior Hooks Two reinforced internal hooks for hanging helmets and other gear. Portable Outdoor Storage Carrying bag for easy portability and storage. Push lawnmower storage (handles up or down), weed trimmer storage, flower pot storage, wheelbarrow storage, long handled lawn and gardening tool storage, bags of soil/fertilizer storage, hose storage, adult bicycle storage, children’s bicycle storage, animal food storage, kids toys storage, sports equipment storage, paint can storage, storage bins storage, snow tires storage, firewood storage, trash can storage, and pool supplies storage. Space Saving = 74” long x 30” deep x 65” high, internal hooks to hang gear. Fits two adult bikes with room to spare. Integrated In-&-Out Floor Flap to easily roll out and roll in bikes, lawnmowers, wheelbarrows and other gear. Quick Set-Up = Less than 15 minutes for one person to fully assemble. Four stakes included to stake to the ground (optional). Tough = Heavy duty polyester materials, reinforced integrated floor, large storm flapped zipper with rubber tabs. Weatherproof = Exterior UV protection, thick interior PVC weatherproof coating, patented water and snow shedding design, integrated floor. Front mesh vent to eliminate condensation and heat build-up. Portable = Lightweight (16 lbs) and easy to assemble and disassemble. Carrying bag included. Affordable = Just $124.95 – Inexpensive and versatile outdoor storage solution. 11. Also includes four heavy duty stakes to secure product to ground.